When an operative of the Trust plants a bomb in Atlantis, the team must find a spy within their own ranks before the Wraith arrive and discover the city. On Earth, N.I.D. Agent Malcolm Barrett arrives at the S.G.C. to give General Hank Landry a warning: The Trust, an illegal intelligence group on Earth that is now under the control of the Goa’uld (SG-1: “Full Alert”), has planted a bomb on Atlantis. The Goa’uld have discovered a threat that may come from the Pegasus Galaxy: the Wraith. Fearful for their own survival, an unknown Trust operative has planted a bomb at the one and only Stargate in the Pegasus Galaxy that can connect to Earth. If the Stargate dials either out to or in from Atlantis, the explosion will be triggered. 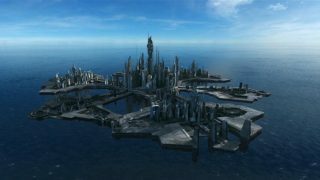 Atlantis will be destroyed along with the city’s Stargate. In an eleventh hour dilemma, Atlantis is scheduled to dial in to give the weekly status report in a couple of hours. But Atlantis is too far away to simply send a subspace warning. Landry tells Dr. Bill Lee to figure something out, and Lee organizes a relay of sorts. An SG team gates to a planet on the edge of our galaxy, where they relay a message to the Daedalus, which is in between the two galaxies traveling back to Atlantis. Hermiod’s quick adjustments to the engines put them in communication range of Atlantis. On Atlantis, Dr. Rodney McKay gets the message and aborts the dialing sequence at the last second, averting disaster. Dr. Elizabeth Weir orders McKay to work with explosives expert Lt. Laura Cadman. It’s an awkward moment because McKay is still creeped out by the fact that he shared his body with her when her consciousness was trapped in his mind (“Duet”). Dr. Weir suspends all gate operations until the bomb is found, stranding Dr. Radek Zelenka on the Peter Pan-like planet with all the kids (“Childhood’s End”). Then Weir sends a message to the Daedalus to return to Atlantis. She wants to be able to interrogate anyone on board who could be a suspect. McKay objects, saying it will cut off their communication with the S.G.C. One last message from Earth reveals that the detonator for the bomb is located on Atlantis, not on Earth. To insure the Atlantis Stargate cannot connect to Earth’s, McKay disconnects the Z.P.M. from the power grid. Lt. Colonel John Sheppard and his teams search the city for the sabotage, with no luck. Inexplicably, the gate dials Earth on its own. Since the Z.P.M. has been removed, there is insufficient power to make the connection. Now the Atlantis team is worried that the Trust operative is in the city because a distress beacon goes off immediately; the gate dialing was only a diversion. For Teyla, the bomb problem is overshadowed by the human problem of a dying Athosian woman named Charin. Teyla considers her like a grandmother, and seeks Dr. Carson Beckett’s help. Beckett tells Teyla that Charin’s heart doesn’t pump enough blood to sustain her. Teyla is glad to learn there’s a treatment, which can help. But Charin thinks she should be allowed to die naturally and have the funeral Ring Ceremony. Because of the Wraith cullings a funeral is a rare event, since few Athosians live long enough to die of natural causes. 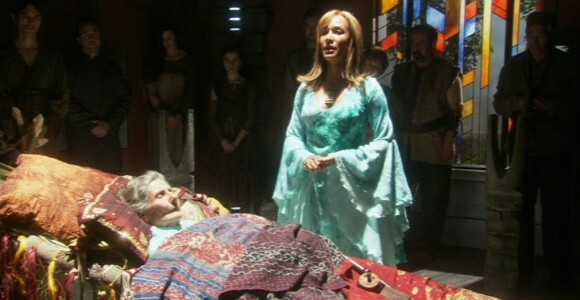 Dr. Beckett explains to Teyla that a pacemaker and other Earth technology can prolong Charin’s life for years to come. Charin refuses, and Teyla makes it clear that Dr. Beckett may only make Charin comfortable until she dies. He respects the decision. When Charin dies, the ceremony commences with Teyla singing the haunting melody of the Athosian funeral dirge. Long-range sensors have recently detected two Wraith cruisers nearby, fighting with each other. With the beacon set off by the Trust operative, they now turn to investigate the planet where Atlantis hides. Months ago, the Wraith fell for the ruse that a nuclear bomb had destroyed the city. To maintain the deception, the Z.P.M. must be reconnect to raise the city’s cloak. McKay shuts down as much power around the city as possible to avoid an overload to the Z.P.M. Someone is to blame, and Weir continues to interrogate Daedalus crewmembers and her own people on the Atlantis expedition. Hated Dr. Kavanagh’s name makes the top of the list of suspects. Weir interrogates him but he defies her, calling her an incompetent. The senior staff meets and decides Ronon should use any means necessary to force Kavanagh to reveal the code to deactivate the overload sequence. Believing Kavanagh is the traitor, Weir orders Ronon to do it. But the bomber activates the pre-launch systems for the city’s stardrive. Since the city is a giant space ship, the power required to launch will also overload the carefully-guarded Z.P.M. By now, the Wraith ships have entered orbit and are scanning the surface. The Z.P.M. must stay plugged in to keep the cloak up. Lt. Cadman discovers that Daedalus commander Colonel Steven Caldwell accessed the necessary systems to create the overload. Once informed, Hermiod beams the Colonel down from the ship without warning. When Sheppard and Weir confront him Colonel Caldwell speaks in the distinctive voice of a Goa’uld and his eyes glow — he is the infiltrator sent by the Trust, or at least the parasitic symbiote that has taken his body is. Caldwell attacks Ronon and Sheppard. But Sheppard uses a taser to shock him until Colonel Caldwell himself can overcome the symbiote and speak. He gives the code to stop the detonation and disarm the sabotage. The Wraith ships find nothing and leave the area. Later, Hermiod uses the Daedalus transporter system to remove the Goa’uld from Caldwell. But Weir is afraid that more people could be infested. And she worries that she has crossed a line with Kavanagh. Yes, that really is “Teyla” actress Rachel Luttrell singing the song at the episode’s conclusion. The multi-talented actress is also a dancer. An early draft of “Critical Mass” did not include Lt. Laura Cadman, but instead a scientist named Dr. Alison Seagle, who was part of a subplot where McKay comes to her defense after Sheppard begins to suspect that she is the traitor. VOTE! How would you rate Atlantis's "Critical Mass?"